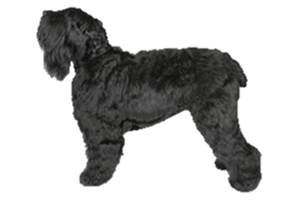 The Black Russian Terrier was originally developed for the former USSR as a military and working dog. It is still often found as a working dog, but also sometimes as a companion. In the 1940s the USSR began developing a dog that would later become the Black Russian Terrier. They began the breeding in Moscow at an army controlled kennel called Red Star and used various breeds to contribute to their project. It is believed somewhere around twenty breeds were used in the development, including the Giant Schnauzer and Standard Schnauzer, Rottweiler, Airedale Terrier, Great Dane, Borzoi, the Lakias and the extinct Moscow Retriever (which was in itself a mixture of Newfoundland, Caucasian Ovcharka and east European sheepdogs).